What’s The First Thing You Should Fix? 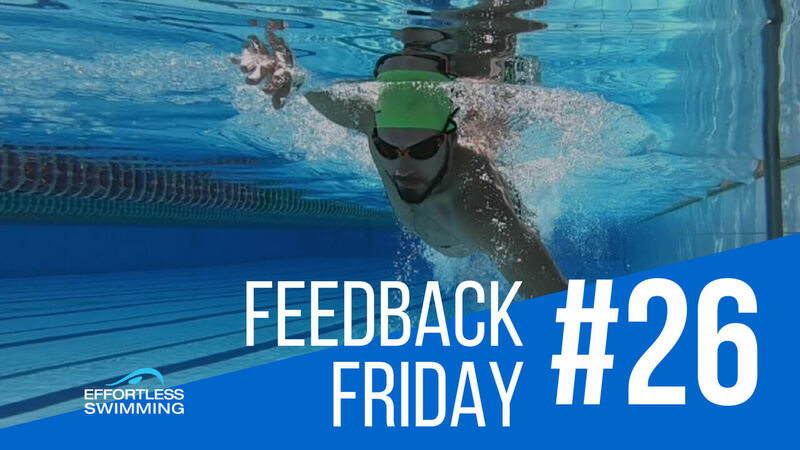 In this episode of Feedback Friday, we look at a swimmer who is having trouble remaining in the front quadrant when she breathes. Instead of looking at the symptom (incorrect timing), we take a look at the cause. We dig deep on what’s causing her lead arm to pull through early, and uncover that it’s caused by her exhaling incorrectly. 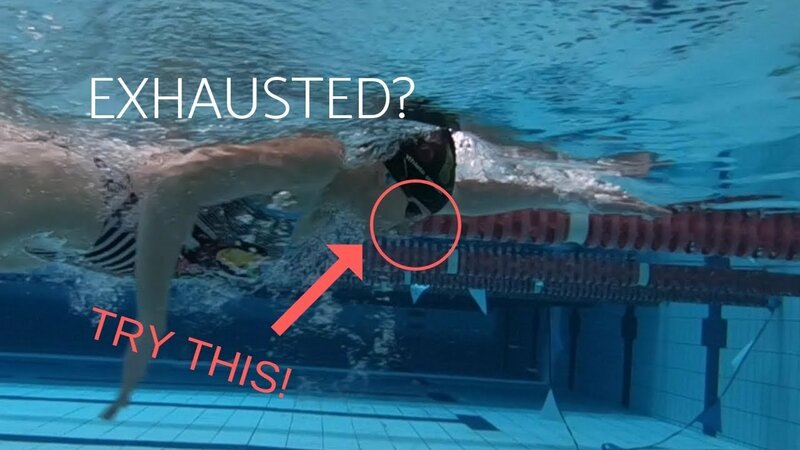 In this video I recommend two drills that could help her fix this and swim a front quadrant stroke (where there is always one hand or arm in front of the head). I also mention the new video membership we are launching in a few weeks. Speaker 1: No matter how good you are at swimming, it’s very difficult to get a breath when there’s nothing out in front to give you balance and stability. Speaker 1: Welcome to Feedback Friday. In today’s video, we’re looking at someone who we looked at in a previous video where we only had her front shot. 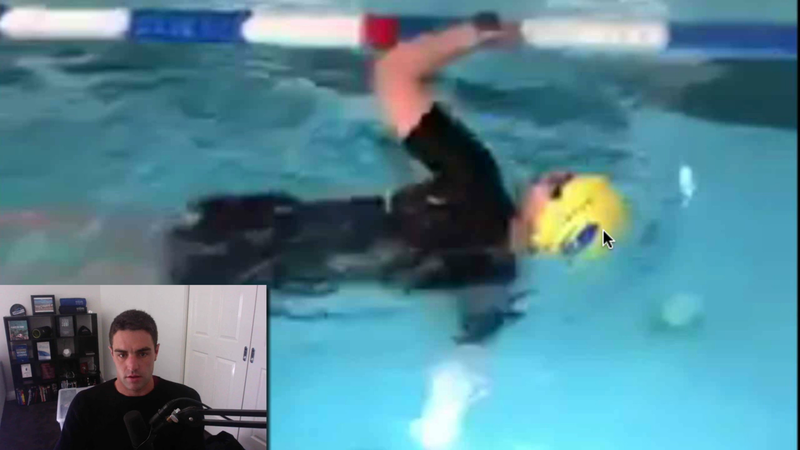 We saw in that video that she probably wasn’t swimming with the front quadrant timing, as in at times there was nothing out in front of the head in terms of no hand, no arm out in front of the head. So the timing was off, and it makes it very difficult to breathe and maintain good timing and rhythm with the stroke. Speaker 1: Now that we’ve got the side view, you can see it here. So right now, there’s nothing that’s in front of her head, so as she’s trying to get this breath, no matter how good you are at swimming, it’s very difficult to get a breath when there’s nothing out in front to give you balance and stability. So what we want to try and do is change that timing of the stroke so that this arm remains out in front of the head for a little bit longer to give her that balance and stability to be able to get the breath and get the timing of the stroke right there. Speaker 1: Now, on the non-breathing stroke, so when she’s not breathing, the timing is fine. You can see the hand is just out in front of the head, and this hand then comes in front of the head there. So it’s still that front quadrant. That’s fine. That’s all you need. So it’s really just those breathing strokes. Speaker 1: So we want to look at all right, what’s causing that timing to be thrown off? Well, if you’ve seen in one of our previous videos, which I’ll link to above here, you’ll know that the way we recommend breathing is when you put your face back in the water, we want to gradually exhale through the nose. Not the mouth, through the nose. You can see we’ve got a little bit of it here, just a little bit, and then when you turn your head to breathe, we want an assertive exhale through the nose and through the mouth to get rid of the rest of the air in your lungs. Speaker 1: You can see here she starts to breathe out quite a bit, but it’s not enough. The reason I say it’s not enough is because if you look at this breathing stroke right here, or this breath here, notice that she turns her head. She’s still breathing out, breathing out, breathing out, and finally, she’s finished breathing out. Then she takes the breath in. Speaker 1: So that first roughly half of the breath is used to still exhale. That should be done in the water instead of out of the water. So that’s going to allow her to get the breath a lot quicker. So essentially as soon as her mouth is out of the water right now, she would start to inhale, get that breath fairly quickly, and turn that head back into the water. So I think that is really the thing that’s causing that timing to get thrown out. So that’s what we look at working on as one of the first things. Speaker 1: Now another thing that will help with that to get the breathing right is also … I’ll just play it through so you can kind of see it here. It looks like she might be sort of chest breathing a bit too much, as in shallow breaths as in through here, where we want to try and get that breath a little bit deeper. So we want to sort of try and get that breath a little bit deeper where we’re not just breathing up into our chest. Think of it feeling all the way down, using your diaphragm, that little bit more. Speaker 1: This is something that’s best practiced out of the water and can take a little while to become a part of your stroke when you’re swimming. But it is something that is worth looking into. It just looks that way. It may not be the case, but from this video it does look like it’s that sort of shorter and shallower breath. So once we can breathe that little bit deeper using the diaphragm, that’s going to help just keep the heart rate down and keep the effort levels down there, too. But that will probably be a lot easier once we change that first thing that we just looked at there. Speaker 1: Now, the other thing that we want to do with the breathing is to try and get that breath a little bit lower, as in we want to look straight to the side. So straight to the side here instead of up at the ceiling because what happens if we turn our head too far, and you can see it from this front shot here, is that the shoulders over-rotate. So if we were to measure this angle through her shoulders right here, it’s going to be about 65, 70 degrees in terms of that angle with the water. Most top swimmers, they’re rotating to about 45 degrees, give or take 10 degrees either way. Speaker 1: So what we see here, over-rotation through the shoulders, and that leads to a very deep catch, or that arm going very deep in the water, and it’s very hard to get much power. We don’t have that much strength when we’re down that deep, but the other thing that that causes, and this is sort of also throwing out the timing, is from here see what the hand does at the back. Speaker 1: Actually, I’m going to bring it up to a slightly different stroke, but you can actually see it here. Now when the right-hand finishes off coming past the hip, you can see that, for the most part, the hand is coming upwards towards the hip. So instead of having that hand pressed back behind her exciting past the hip, right now it’s coming up towards the surface of the water up towards the hip. 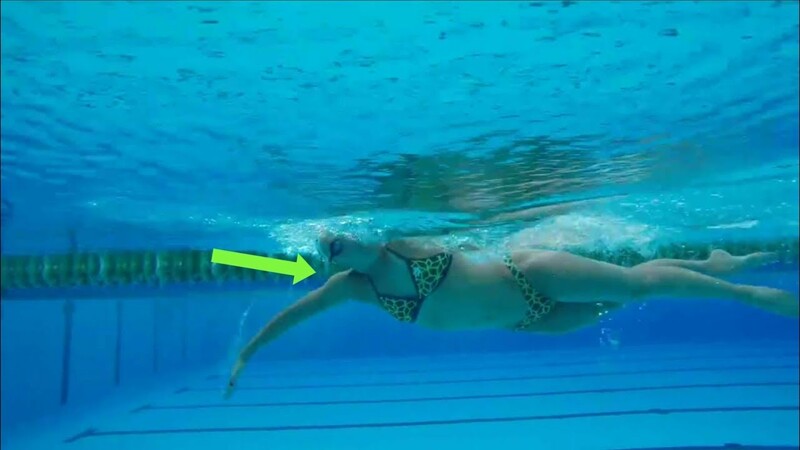 Notice how the hand is getting drawn forwards in the water instead of exiting past the hip. Then we’re out of the water, and the hand can just fairly come over. So it’s getting a little bit stuck, which is also causing some of that timing to get thrown off as well. Speaker 1: See how the hand is coming here, getting drawn through the water, all right? So we just want to get it pressing back past the hip to be able to get it over a lot easier. You actually see it on this stroke, so that’s a better one. It presses back past the hip. Now the hand is clear. It’s free of the water, and it can come over a lot easier. So that’s what we want to work towards. Speaker 1: Now, the other thing that that’s sort of linked to here in some ways is a bit more of a hand recovery. In our Effortless Swimming digital membership, we’ve got these sort of how to fix your stroke, these drill progressions, to work on specific aspects of the stroke. This is one that I often prescribe to a lot of our members is if they are recovering and the hand comes in front of the elbow before it passes the shoulder, then we typically classify that as hand recovery. We want it so that the elbow stays in front of the hand for the first half of that recovery. So the elbow should be in front until about here. Then the hand can come in front. Speaker 1: What does that mean? What’s the point of it? Well, a few things. It does impact what happens under the water just because of your arm more restricted through the shoulders, but it also often leads to a very flat entry position. So you can see here the hand, the elbow, the forearm mostly going in together. It’s a little bit flat, so we don’t quite get that full drive forwards or that momentum with having the elbow a bit higher here. So it can impact that as well. Speaker 1: So we want to look at it not what’s the symptom. No, we want to look at what’s the cause of actually this, and we want to start from the very beginning. One of the things that I’ve sort of written down, that I’ve sort of thought a lot about in the last couple of years, is that hierarchy of what should we work on first and how do we go about applying that to people’s stroke. In this video, really I think the first thing that we need to work on and adjust is breathing. Speaker 1: So what could she do? What is something that will help her with her breathing? Well, I’d recommend just, first of all, just practicing that gradual exhale through the nose and then a more assertive exhale to help her hopefully breathe a little bit easier. But the other thing that she could do to help her get that breath a little bit lower so she’s not looking up to the ceiling here is a drill like our FKB drill, which is front kick breathe drill, which you can see here. In this drill, it’s just a great way to practice breathing to the side and keeping one arm out in front to give you that stability and balance, get the feeling for what that’s like. So a simple drill like the FKB drill can help a lot of people make that adjustment. Speaker 1: Then in terms of not rotating so far as she’s getting that breath, a similar thing that FKB drill is really going to help. Or another drill could be something like two-stroke switch with paddle, which is a drill that we use, again, just to get the feeling for keeping that lead arm out in front a little bit longer to give you that balance and support. So two-stroke switch drill. Speaker 1: Now, drills are only as good as the reason that you’re using them for and the purpose and the specificity of what you’re actually trying to fix, the problem that you’re trying to fix. So, with all these drills, just use them for any issues that you need to correct or any problems that you’re trying to fix because we don’t recommend doing a whole session of drills. What we really like to do is in your warm-up practice a couple of drills. Get a feel for those stroke changes that you’re looking to make, and then go about your normal swim session. That is really the best way to improve your stroke. Speaker 1: So if you’re looking for ways to improve your own stroke and fix some of these areas that you might have as well, we are about to launch the Effortless Swimming digital membership. Now you would have heard me talk about the Effortless Swimming membership, which is where I coach people from all around the world where they send me their videos. I analyze their stroke, and I give them specific drills and things to work on as part of their stroke. We do that over the course of 12 months and on from there. Speaker 1: I know that’s out of the reach of a lot of people, so we’re actually putting together this digital membership where we’re going to have all of our video courses and content and drills and ways that we fix each of the flaws in the stroke, so you can see exactly how we go about it. It’s going to be a lot more affordable and in the reach of everyone. So we’re going to launch that in the next couple of weeks. So if that’s something that you think will help your own swimming, then I’ll let you know in one of the YouTube videos when it’s ready to go. Speaker 1: Thanks for watching. Make sure you like and subscribe, and thanks for watching the channel. Next: 2-Beat, 4-Beat or 6-Beat Kick? Delivered Straight To Your Inbox? Yes! Send me swim tips each week! 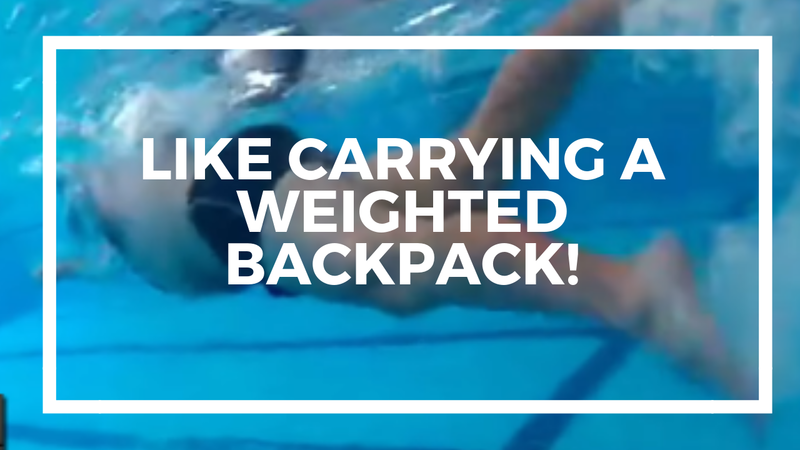 Like Carrying A Weighted Backpack! THIS Is Why It’s So Hard To Get A High Elbow Catch! Show Me The Virtual Clinic!